Music students from Grand Valley State University recently helped 20 local high school students compose and perform music through an internship with the Grand Rapids Symphony. Four Grand Valley students spent February 13-18 working with leaders from Creative Connections, an international non-profit cultural education organization, to help the symphony's Mosaic Scholars compose, rehearse and perform original pieces of music. The Mosaic Scholarship is a program offered by the Grand Rapids Symphony to local African-American and Hispanic music students, ages 12-18, who receive 24 one-on-one lessons with symphony musicians over the course of one year. 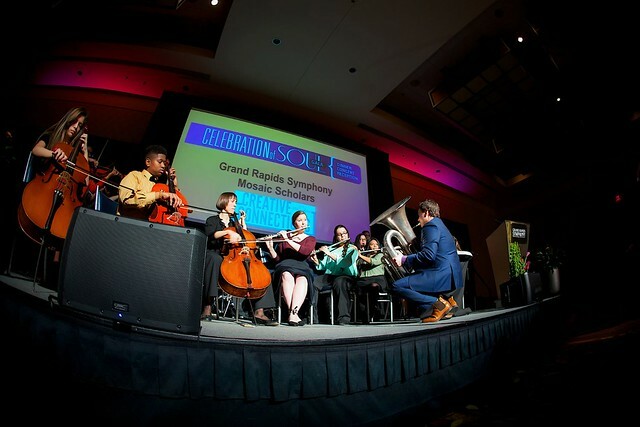 In addition to individual lessons, Mosaic Scholars have the opportunity to form an ensemble, create original compositions and perform them live during the Grand Rapids Symphony’s “Celebration of Soul” dinner and “Symphony with Soul” concert featuring guest vocalist Lalah Hathaway. This year, the concert took place on Saturday, February 18 at DeVos Performance Hall. The Grand Valley students working with the Mosaic Scholars included Dana Van Dyke (piano), Kayla Torre (bassoon), Margaret Hawley-Lowry (violin) and Maiya Howard (flute). Kayla Torres, a senior majoring in music performance, said her internship experience taught her the value of strong leadership, and the need for adaptability when working with young students. "This experience helped me understand the needs, talents and passions of these students, as well as strategies for coaching them through difficult tasks," said Torres, from Marysville. "The experience was just amazing. Words cannot describe how blessed I am to be able to work with such amazing leaders and talented students, and to perform on the stage where the Grand Rapids Symphony performs." While Dana Van Dyke has created music in the past, she said this internship provided her with a new and unique perspective about composing. "Much of the music was composed on the spot during rehearsals with others composing their own part right along with you," said Van Dyke, a freshman majoring in piano performance. "It gave me much more freedom to go with whatever my mind decided, and there was less pressure about hitting a 'right' or 'wrong' note. It gave me a whole new perspective on where music comes from and how it can be created with meaning." Claire VanBrandeghen, Grand Rapids Symphony director of education, said this internship was an invaluable opportunity to strengthen the longstanding relationship between the symphony and the university while also preparing the Grand Valley students for their future careers. "To be able to deepen our collaboration to include real-life, practical application learning for GVSU students who may be considering a career in music education is of significant importance to us," she said. "It is likely that many, if not all of the GVSU students who participated in this internship, will be working with students at some point in their musical careers, whether as private instructors, classroom music teachers or in other entrepreneurial ways." Van Dyke said that the experience of performing with the Mosaic Scholars and Creative Connections leaders at the end of the internship week was "pure joy." "Being able to face an audience of that size and present our works of art with one another as musicians who share the same love of music was indescribable," she said. "I felt such a deep sense of pride in our group, which had become nothing less than family over the span of just one week."